My name is Jamison Go and I am the team captain, primary driver, and one of the engineers for the BattleBot SawBlaze Team. Currently I am a R&D engineer at an additive manufacturing startup in the Burlington, MA. My experience is in both mechanical and electrical engineering, and I have spent many years as a researcher in robotics and additive manufacturing. My teammates (Lucy Du, John Mayo, Chris Merian, Joao Ramos, Alex Hattori, and Mason Massie) are either current students or alumni of MIT. The primary active weapon of SawBlaze is a diamond-tipped fire rescue saw blade mounted on an articulated arm; it is powered by a brushless motor capable of 15 kW of cutting power. 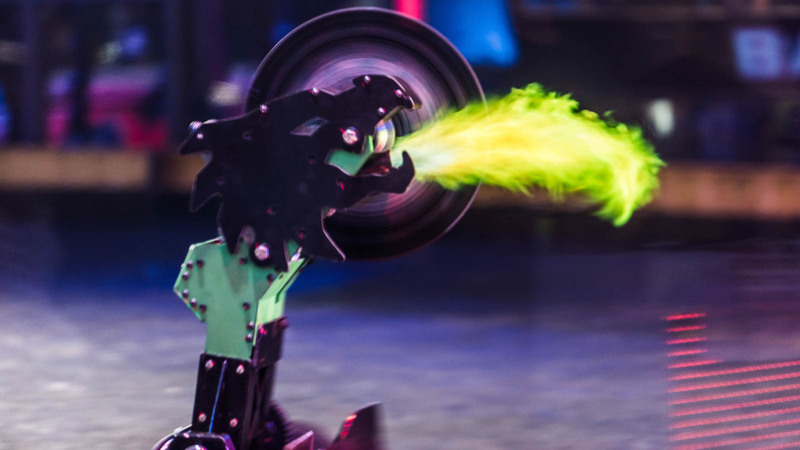 SawBlaze also wields a flamethrower mounted to the arm that blasts a green-colored flame approximately 350 degrees Celsius (662F) in temperature. The flamethrower projects over the cutting zone, influcting a “slash and burn” combination attack. However, SawBlaze is best known for its drive base. We have the most powerful drivetrain in the field coupled with an array of front plows that allow us to get under nearly any opponent. The basic strategy is to use our drive agility and power to out maneuver our opponent and pin them firmly against the wall. Once we have our opponent secure we can slash and burn! I first saw BattleBots when I was 11 or12 years old. I loved the combination of design challenge mixed with skill and the grand stage appeal it gives engineering. I was instantly hooked on robot fighting and have been competing in the amateur circuit for the past 14 years. My first combat robot was a beetleweight (3-lb weight class), which I built in 2004. It featured a dustpan front, 2-wheeled drive in the rear, and some form of overhead weapon eventually amounting to a circular saw. Sounds familiar doesn’t it? I built it from sheet metal from the hardware store and populated the chassis with motors and electronics from a surplus store. Although my construction techniques and materials were unremarkable and the design was unorthodox, it won first place at its inaugural event. However, it was not a flawless victory, and I learned about many great materials and fabrication techniques I could use in the future. 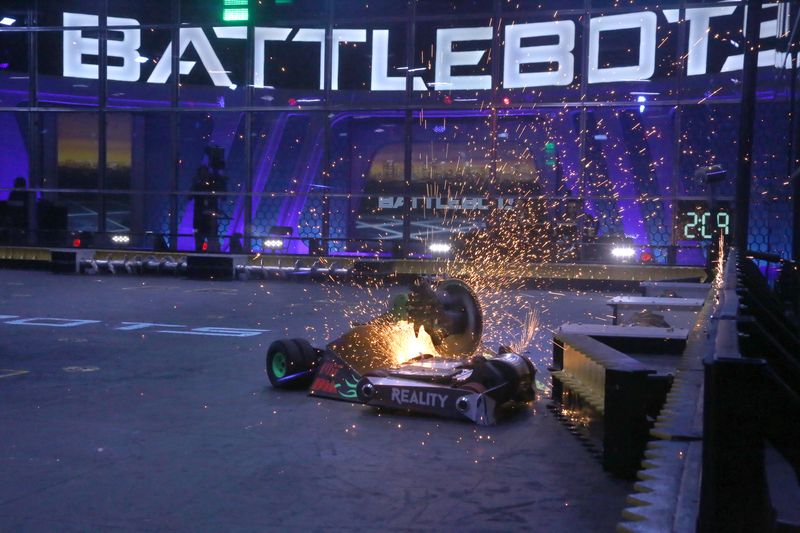 BattleBots is the grand championship for robotic combat across the world and competitors in BattleBots are considered the pros. 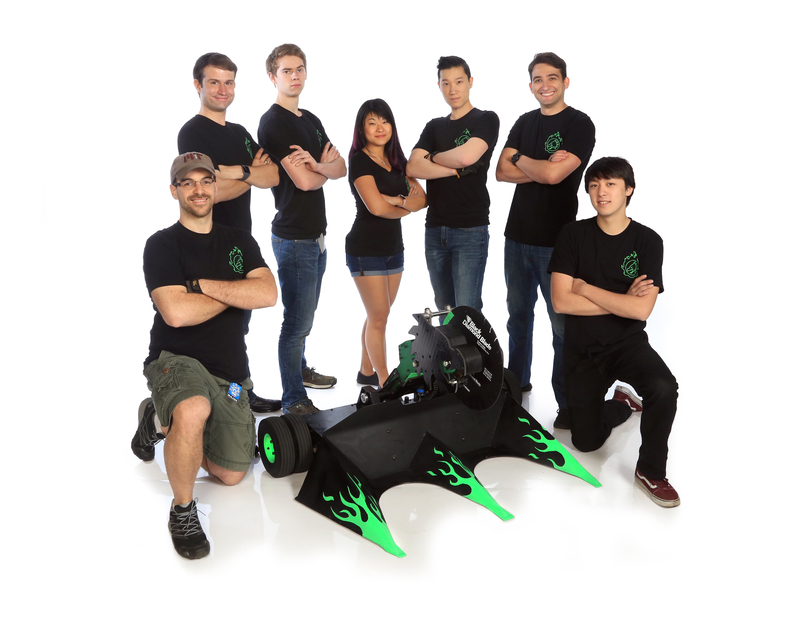 The opportunity to compete in BattleBots is a testament to my growth as an engineer and reputation as a competitor in the amateur circuit. It is an absolute dream to meet my childhood heroes and battle them as equals on the big stage. We are happy with our achievements during this 2018 season. We had four wins and two losses and made it to the top 16 as the fifth seed. 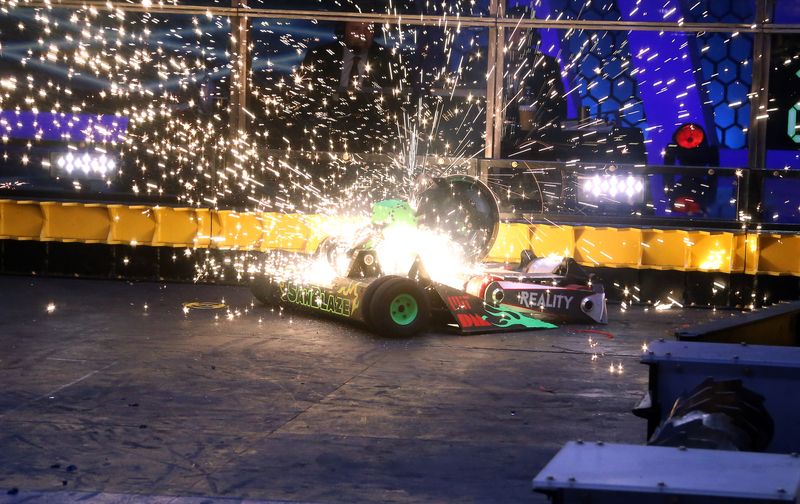 BattleBots fans say SawBlaze has the most powerful, most effective saw in the history of the sport and to have that title is truly an honor. The short build period was painful for a drive-critical machine like SawBlaze because it meant very little time was spent in drive practice. Next year we will prepare with a grueling drive regimen using the old chassis. I think the most effective design in the current meta is the vertical spinner with frontal wedge elements. When the weapon connects, it inflicts more damage because it uses the floor as a reaction surface and can disorient opponents by throwing them in the air. The wedge elements feed opponents into the blade and are effective at combating other wedges. That is why I believe top-ranked robots like Bite Force and Minotaur are so effective. This season there were a large number of vertical spinners so driving a robot where a wedge is a major part of the offensive strategy was absolutely nerve wrecking. My favorite BattleBot experience is actually interacting with our fans after the show has aired. This season we have made a name for ourselves and have fans of all ages. When we travel to outreach events we get to meet them and talk about the robot, combat robotics in general, and how to get started. The younger fans love it, especially when they learn I started building about their age. We find BattleBots is an opportunity for us to share our experiences and inspire others to explore engineering and the sciences. In designing a combat robot, I start with the requirements and limitations; those frame your overall design and component selection. From there it is a semi-iterative process to balance the requirements against the finer elements of the design. 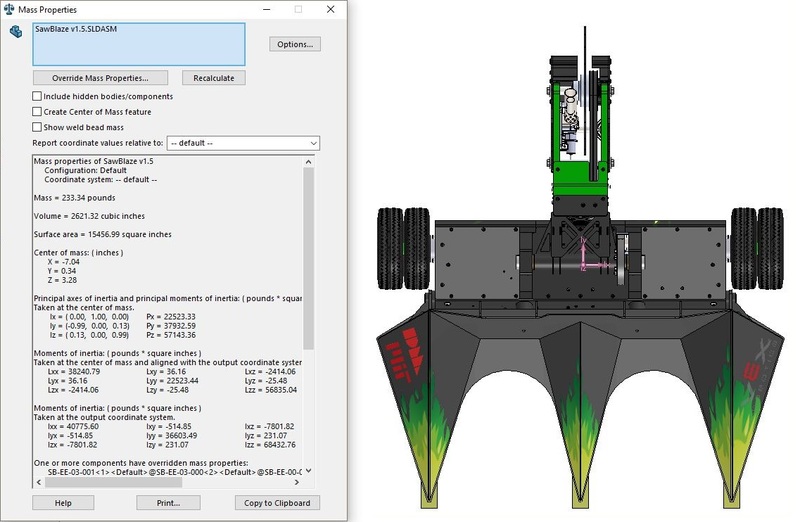 That is why computer aided design (CAD) tools like SOLIDWORKS are so powerful in BattleBots. 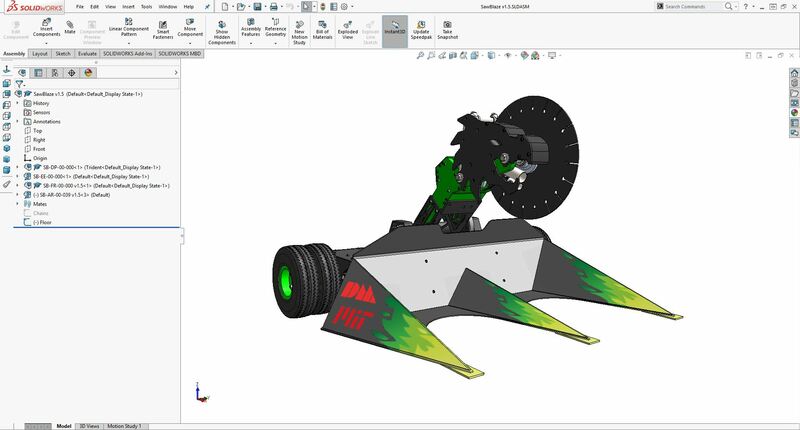 I started using SOLIDWORKS in 2005 and it has been the most valuable tool in my combat robotics career. It is a diverse software that features tools for all stages of a device from design to fabrication preparation. This integration allows me to move quickly throughout the design process. SawBlaze was designed completely in SOLIDWORKS. Mass properties ensured we would not exceed the 250-pound weight restriction and verified that our center of gravity was located properly for all orientations of the robot. The 3D sketch tools and sheet metal toolbox were invaluable for creating the front plow geometries. SOLIDWORKS generates a bill of materials (BOMs), which we used to generate checklists for spares and fasteners. We also used SOLIDWORKS to create drawings to contract out some of the larger components that we cannot fabricate at MIT. We have a sheet format that preserves all the critical information so that we can hit consistent tolerances on spare components despite switching suppliers between seasons. One feature my team found critical to our organization is SOLIDWORKS Product Data Management (PDM). The team is currently spread across the U.S., and it is challenging to coordinate design of subassemblies. SOLIDWORKS PDM allows us to work on this large assembly together by indicating ownership, supporting revision control, and clearly indicating the design status of components. Team SawBlaze would like to thank SOLIDWORKS for this opportunity to share our experience. We furthermore would like to thank our 2018 sponsors who made this incredible journey possible.